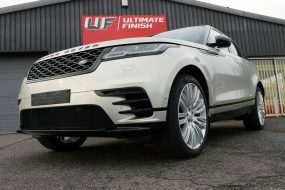 New Car Protection Treatments have been growing in popularity as the phenomenon of the ‘ceramic coating’ has become increasingly widely known. Based on nanotechnology, ceramic coatings are inherently tough as their molecules have a small volume compared to their surface ratio. They use chemical bonds to deliver a level of permanent protection not provided by traditional polymer-based sealants offered by some dealerships. Their inherent toughness makes them better able to resist impact and chemicals, making them ideal for protecting clear coats and lacquers. Although clear coat technology has progressed enormously over the years in terms of the ability to protect paint pigments from fading, they remain relatively easy to damage. Most often, the damage causes a loss of shine, and the overall appearance becomes dull. This occurs through a variety of factors: acid rain etching, chemical fallout, some UV-induced fading particularly for red colours, and swirls. Swirls are most commonly introduced during the weekly wash, through poor techniques or hurried processes. 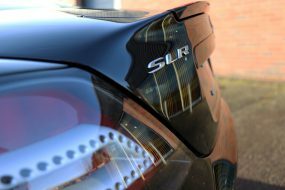 Once the shine has been lost, machine polishing is required to remove small amounts of the damaged clear coat to reveal the gloss beneath. 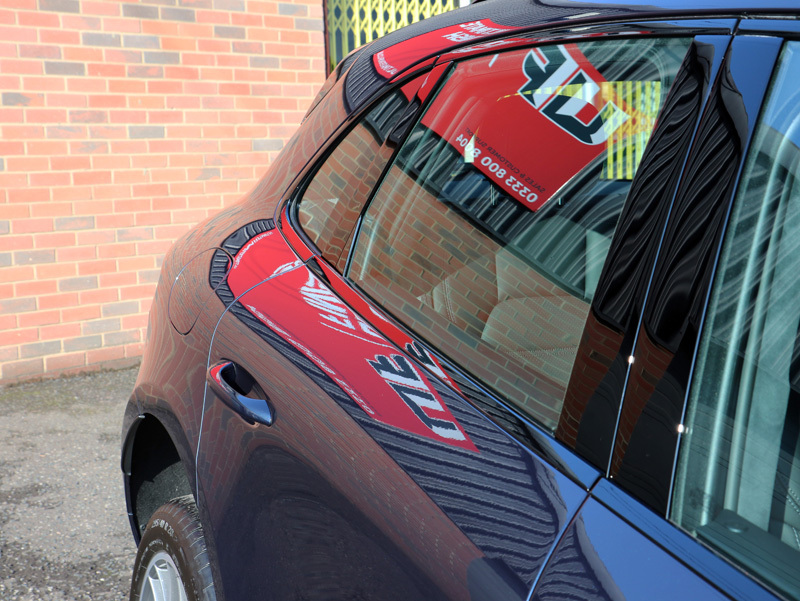 Whilst machine polishing works well, the majority of the UV protective elements can be found in the upper layers of the clear coat, so it’s not a remedy that should be employed too often. 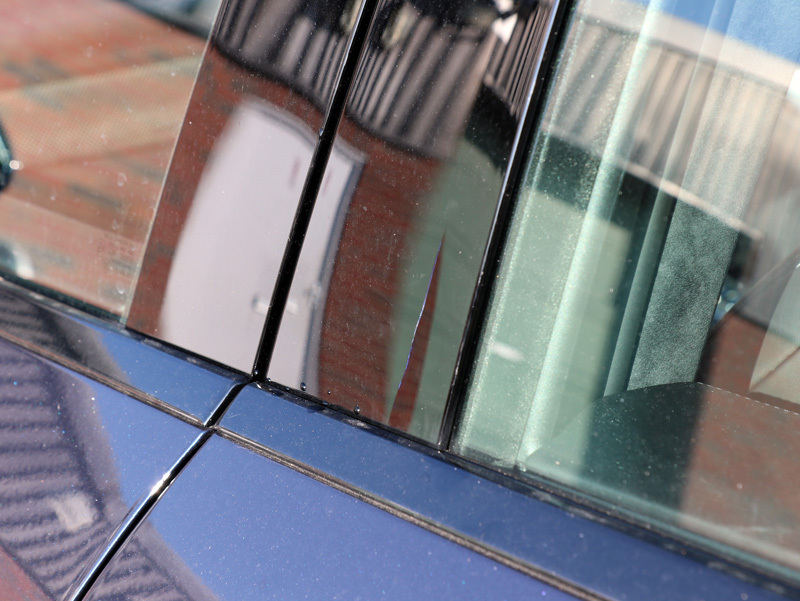 However, damaged paint has a negative impact on the saleability of a car, deterring buyers and forcing down the price. One solution to the problem is to have the clear coat protected with a ceramic sealant that is better able to withstand industrial and environmental fallout and provides a degree of resistance to wash-induced swirls. 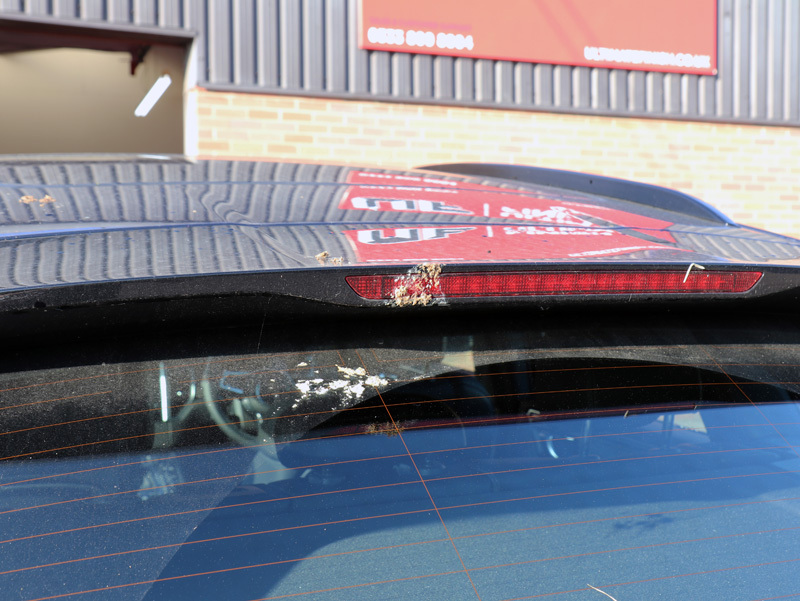 Ideally, the protection should be applied whilst the car is brand new before damage has had a chance to accumulate. 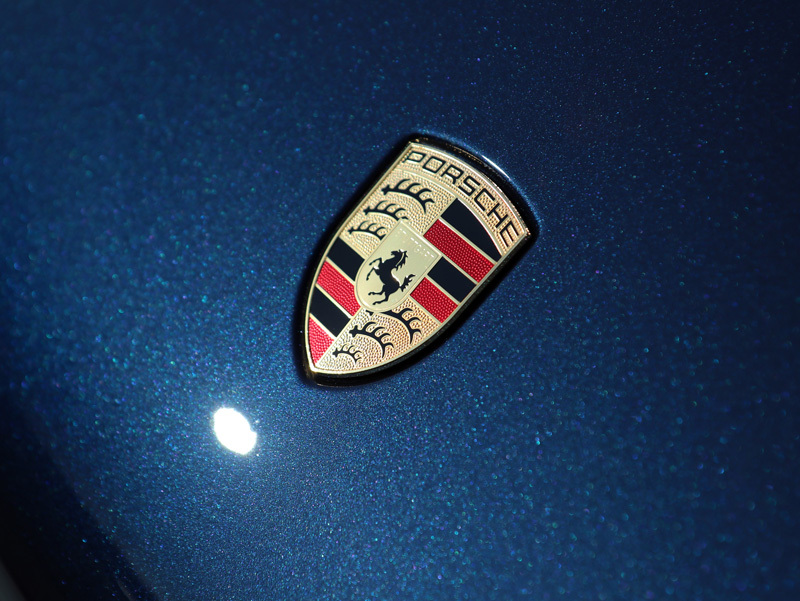 The owner of this brand new Porsche Macan Turbo in Night Blue Metallic was well aware of the protective characteristics that ceramic coatings bring. Timing though, is everything, as he was due to collect his new car just before going on holiday! As a result, he booked his car in when he returned, specifying a New Car Protection Treatment with Gtechniq Crystal Serum Black (CS Black). CS is Gtechniq’s flagship ceramic sealant, well known for its ability to resist swirls and for the seven-year manufacturer-backed performance guarantee! 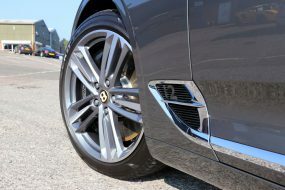 Additionally, the owner required Alloy Wheel Protection which uses a ceramic coating to repel dirt, oils, and grime, and inhibits the build-up of damaging brake dust particles. 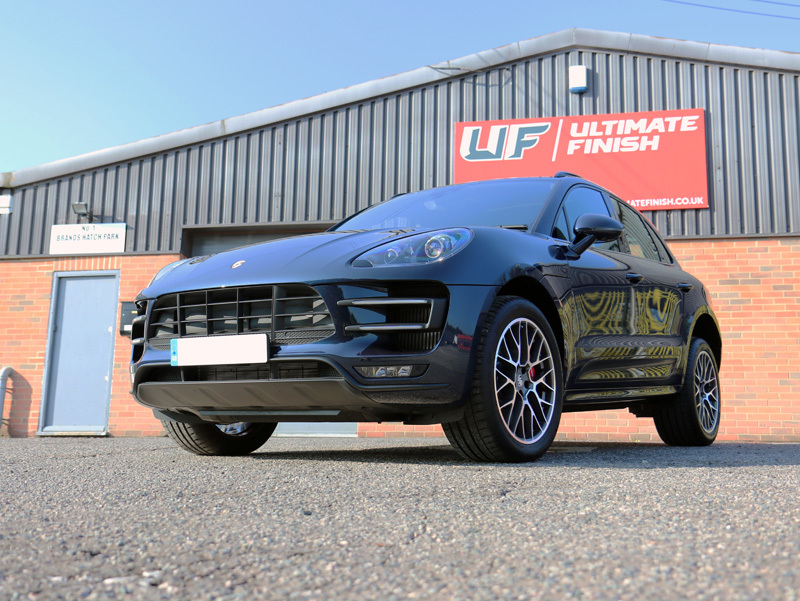 As the Macan Turbo had been kept outside whilst the owner was away, on arrival at UF’s Brands Hatch Detailing Studio it was in need of a thorough clean! 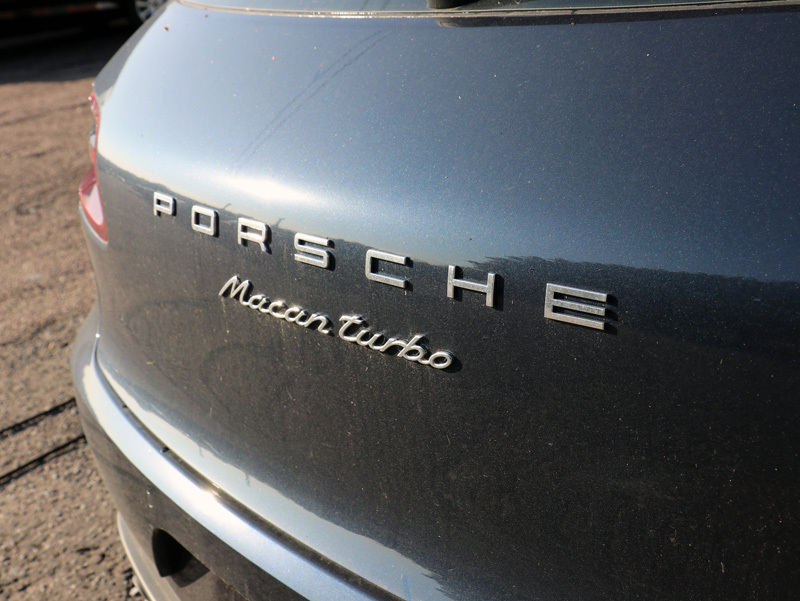 First, the Macan Turbo was checked over for any sign of damage which would be noted on the Vehicle Appraisal Sheet (VAS). Damage was spotted on the piano black trim where the door pillar meets the door, above the handle. On informing the customer, he was able to get the dealership to take care of this under warranty. 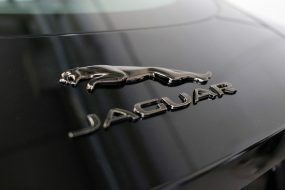 Once fixed, he could then arrange to bring the Macan back to the studio to have this area protected. 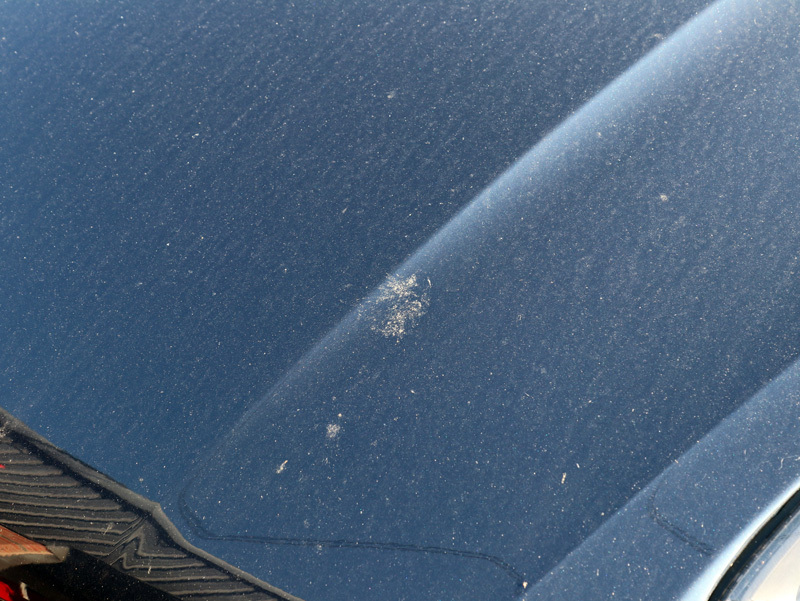 Bird droppings, grit, dust and pollen, along with general fallout had accumulated all over the bodywork. 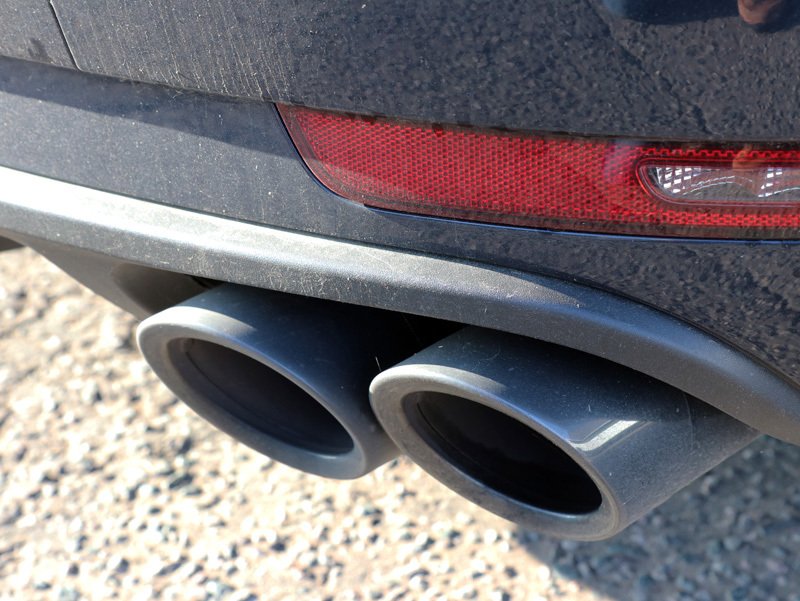 As the car had been driven to the studio, the hot exhaust tips had collected driving debris which had bonded to the hot surface. 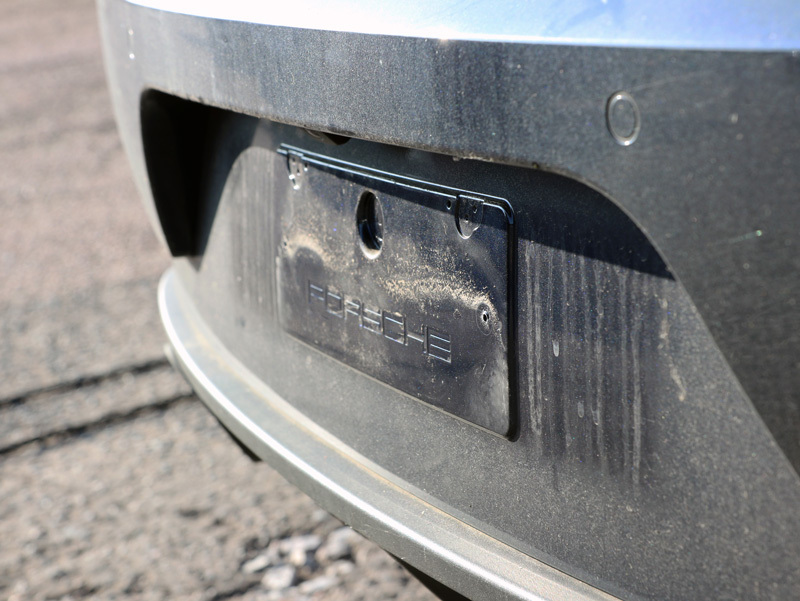 To start the lengthy decontamination process, the number plates were removed. 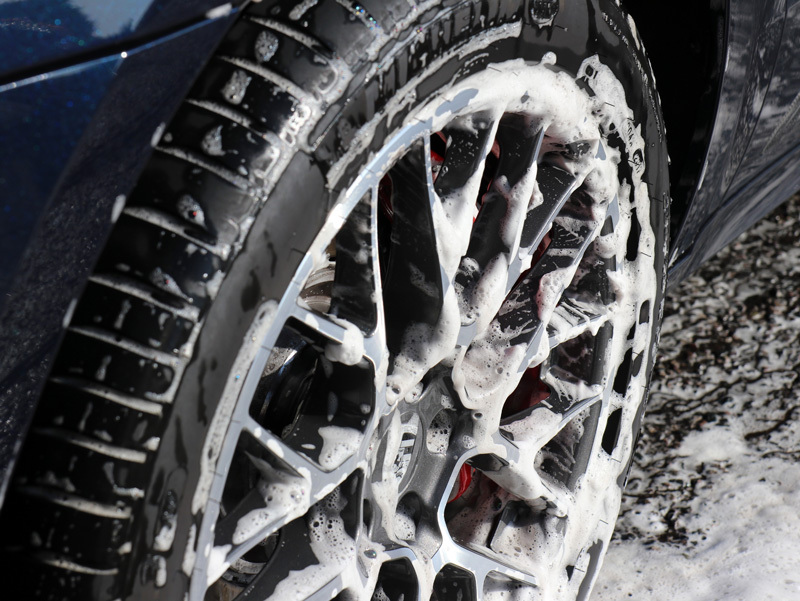 Then, the wheels were treated with Ultimate Snow Foam to remove general dirt and grime. Gtechniq W6 Iron and General Fallout Remover was sprayed onto the wheels to treat iron contamination. This comes from brake pads which shred when they’re hot but can also be collected from the brake pads of passing cars, especially on motorways. Additionally, many new cars are transported via rail at some point on their journey from the factory to the dealership and they are sometimes stored in railway sidings. Iron particles are transferred by train wheels during this stage. Once these particles come into contact with the wheels, they bond quickly and begin to oxidise, swelling as the oxidation takes place. Scrubbing at the surface with a mitt or brush often will not remove this type of contamination, so the most effective removal method is to apply a specialist product. The active ingredient in Gtechniq W6 changes colour to indicate the presence of iron and by chemical reaction, shrinks the particles, causing them to break their bond. The particles can then be safely rinsed away without using contact. 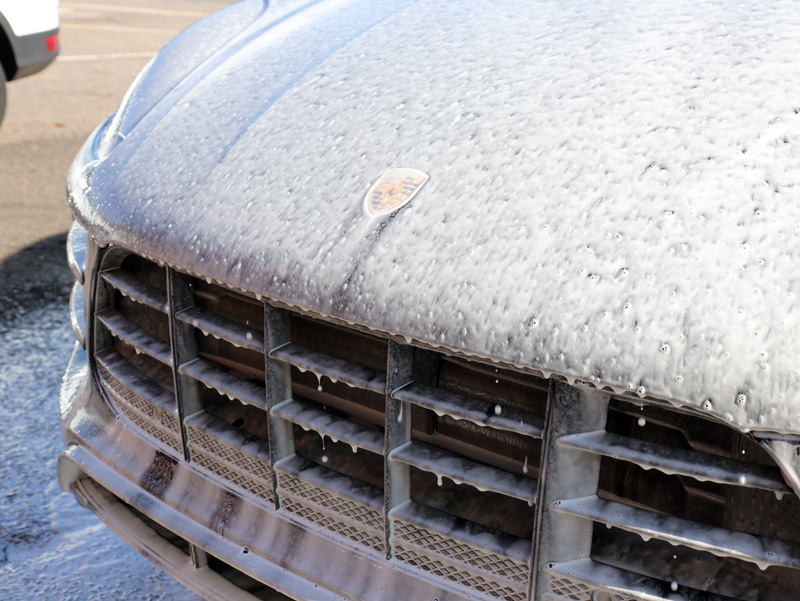 After degreasing the bodywork and wheels, the Macan Turbo was pre-cleaned using Ultimate Snow Foam. Applied using a professional foam lance attached to a pressure washer, the thick foam clings even to vertical surfaces, increasing dwelling time and allowing larger particles of dirt and grit to be lifted away and encapsulated within the foam. 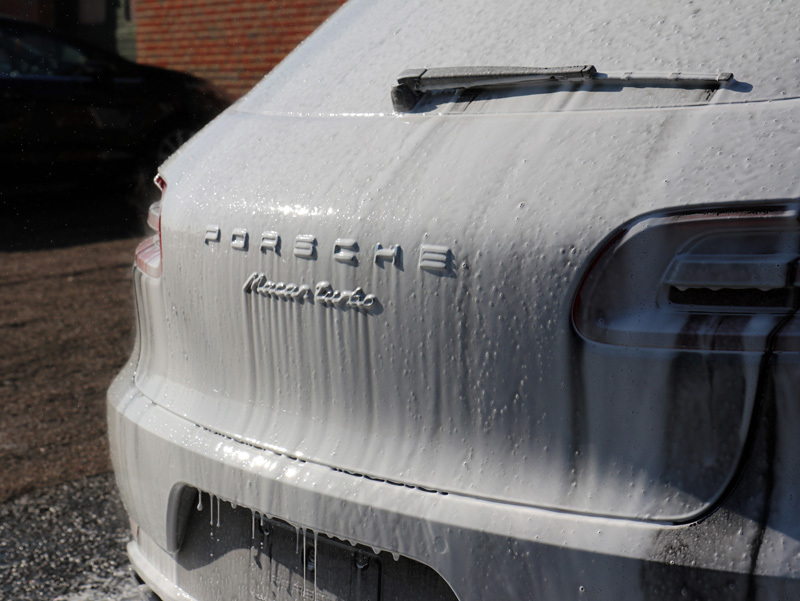 Ultimate Snow Foam gets into all the nooks and crannies, for deeper pre-cleaning. 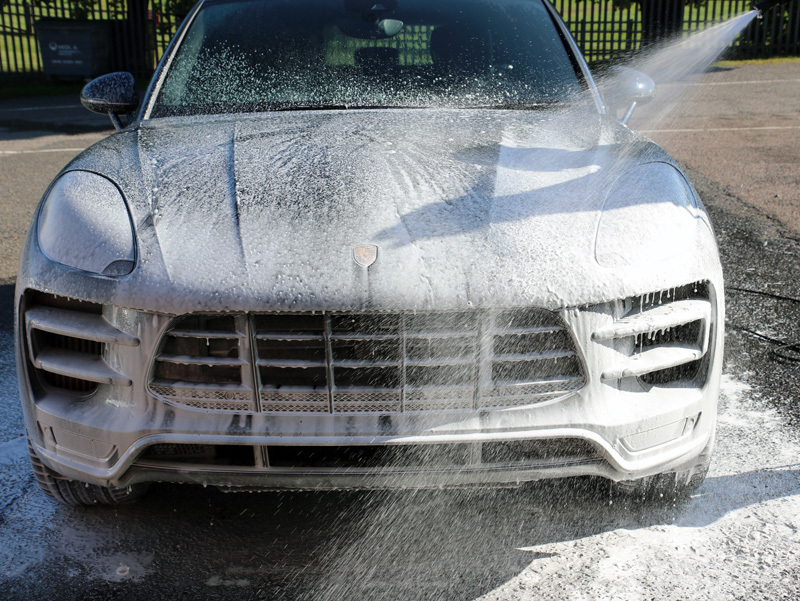 After rinsing the foam away, the Macan Turbo was washed using the Two Bucket Method. This involves keeping wash and rinse water separately in designated buckets, both with Grit Guards. The wash mitt is dunked into the soapy wash water, a section of the car washed, and then the mitt is rinsed in the Rinse Bucket. The mitt is brushed across the Grit Guard, releasing dirt particles trapped in the pile. The mitt is then wrung out before being dunked in the clean, soapy Wash Bucket water and the process repeated until the car is clean. This prevents dirt from the vehicle being added back to the wash water and so potentially being reintroduced to the paintwork. 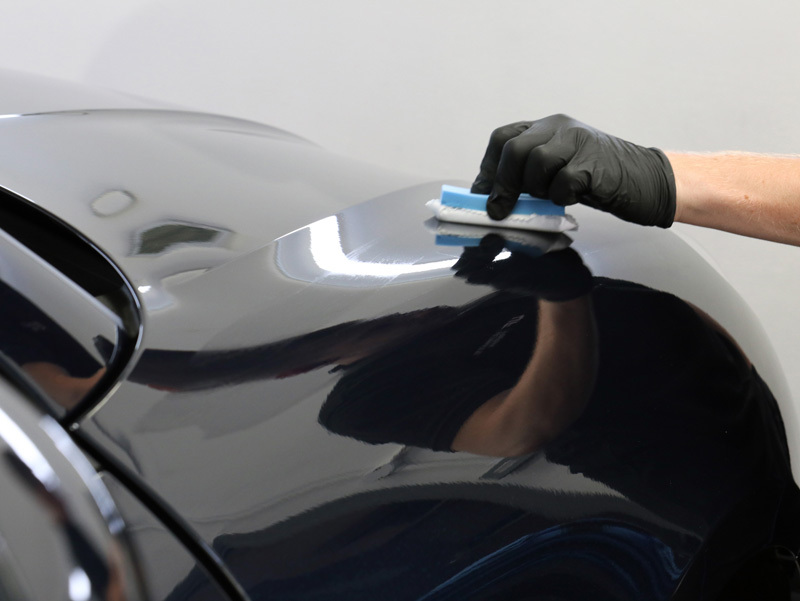 This method helps prevent incurring accidental swirl marks and is an important step for preserving the gloss of the paintwork. Once the car was clean, the suds were rinsed away. An Aqua Gleam De-ionising Water Filter was attached in-line with the hose to deliver a final, pure water rinse. The filter neutralises the impurities found in tap water that cause white water spot deposits. 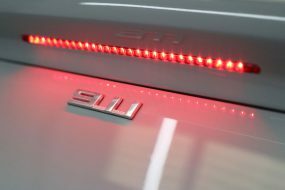 The car was carefully dried using soft microfibre drying towels and brought into the studio where the paintwork was closely inspected under high-intensity lighting. 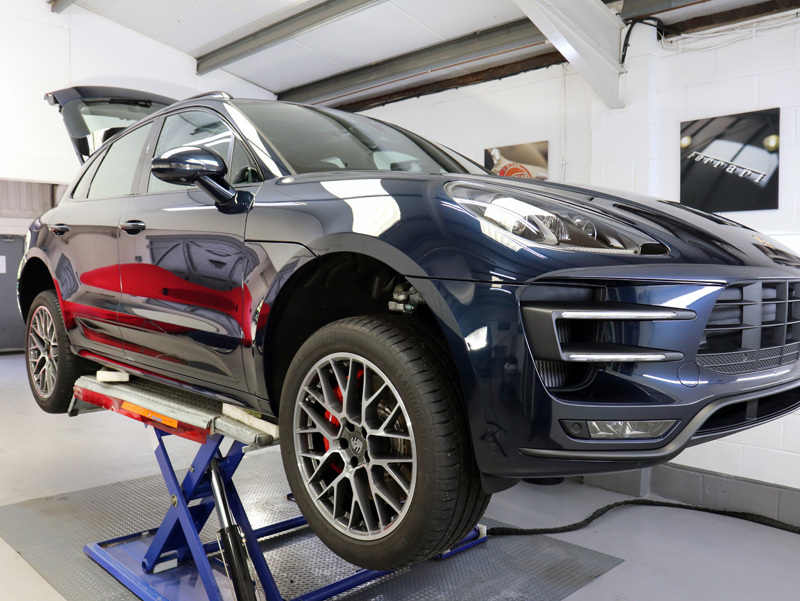 To ensure the paintwork was in perfect condition prior to the coating being applied, the Macan Turbo was given a hand polish using PolishAngel Esclate Lotion, a highly effective paint cleaner which improves the shine and colour intensity of paintwork without the use of fillers. All surfaces were then wiped using Gtechniq Panel Wipe to remove any silicon or polish residues, preparing the paintwork for the coating. Applied correctly, this innovative coating separates during curing to become a two-layer system. The lower layer cures to a hardness of around 7H (on the pencil scale). The upper layer cures to around 9H. This combination provides a flexible underlay with a tough, hydrophobic top coat, the better to withstand swirls and attack by chemicals with extremes of pH. The coating is applied using a short-fibre microsuede wrapped around a foam block (for stability) and allowed to dwell briefly on the surface. 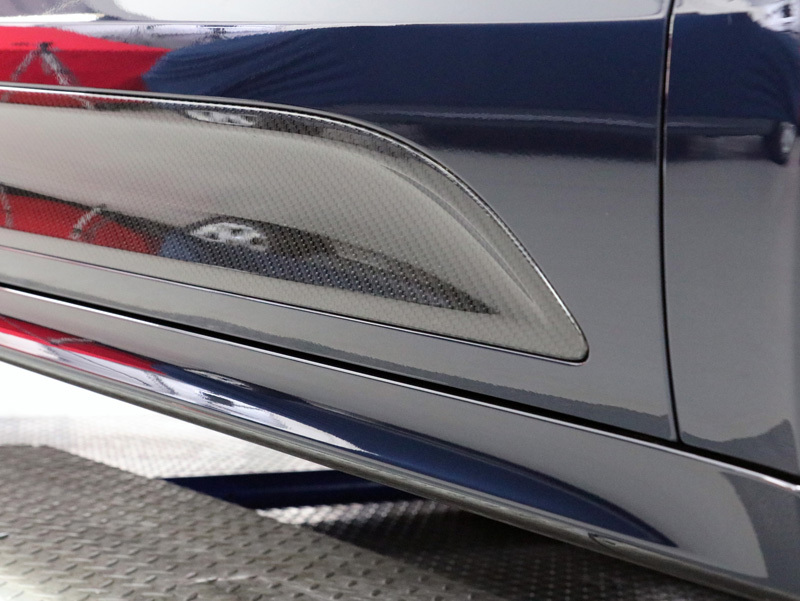 This is normally completed one panel at a time and when the coating presents as a haze, the bonding process has begun and it is time to buff off the excess residue. The residue is removed using ultra- soft microfibre buffing cloths. 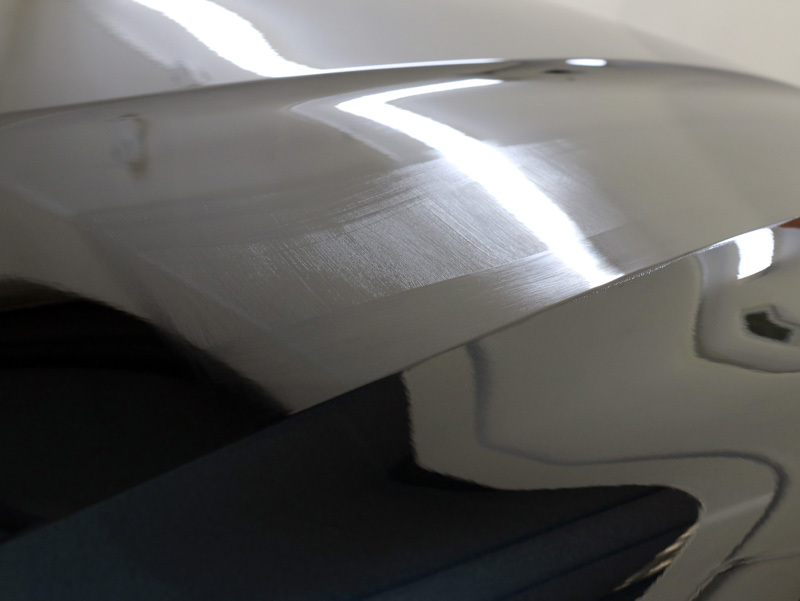 Once the base layer of Crystal Serum had been allowed to cure for three hours, an overcoat of Gtechniq EXO v3 Hydrophobic Coating was applied to raise gloss levels further and to increase the hydrophobic function of the surface. The CS Black combination is suitable for use on all substrates, so was also applied to the (undamaged) piano black trim and carbon fibre door inserts. 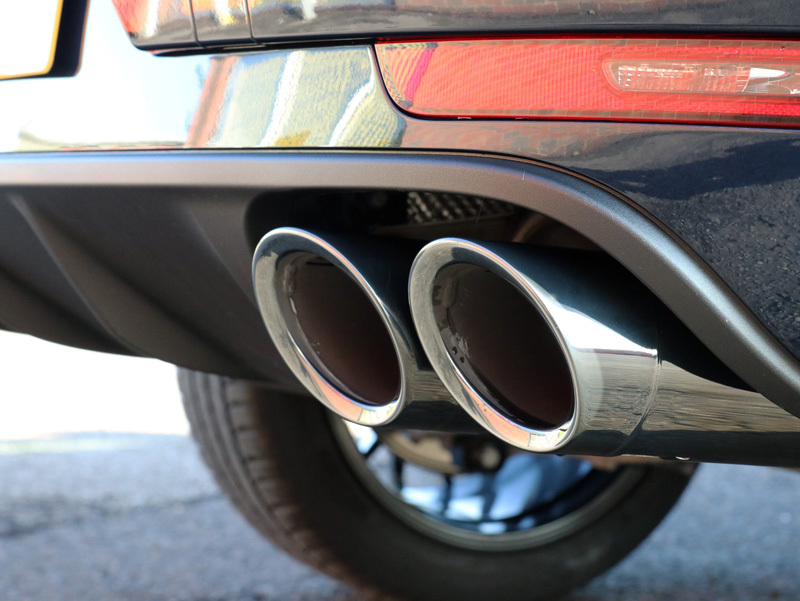 The exhaust tips were first cleaned and polished using Britemax Easy Cut Metal Polish before being protected with Britemax Final Shine Metal Sealant. These two products have become known as the Britemax Metal Twins. Now protected, soot and grime will be repelled making them easier to clean during the weekly wash. 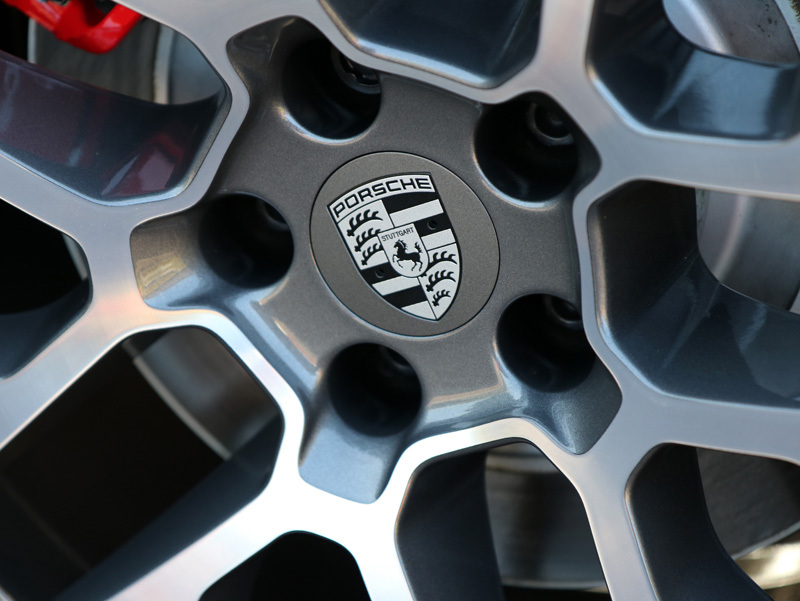 The wheels and brake calipers were protected using Kamikaze Collection Stance Rim Coat. Resistant to high temperatures, Stance Rim Coat will not burn off when the metal becomes hot during driving. The hydrophobic, oleophobic coating repels water, grime and dirt and helps prevent brake dust particles from bonding to the treated surface. 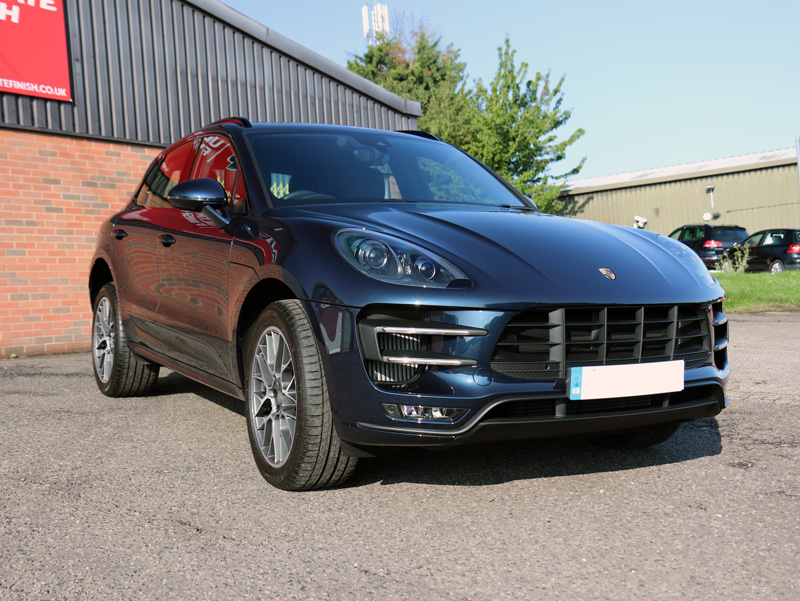 With a seven-year guarantee from Gtechniq, safe to say this Porsche Macan Turbo will retain its stunning appearance for a long time to come!